Horses, Dogs, Cats, and all animals are sentient beings, bringing us countless gifts and lessons; they are bearers of unconditional love. Being that Animals are very sensitive, they are subject to environmental factors, external stressors, health concerns, and unnatural diets that can all lead to less than fulfilling lives. A Wholisitc Touch facilitates the restoration of health and the enhancement of well being for animals. During the initial consultation the animals’ immediate needs as well as long-term health goals are discussed and a protocol is uniquely designed for each specific animal. 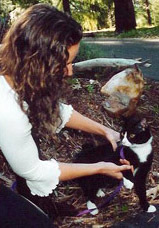 Sessions for animals can include a single technique or a combination of techniques such as Bowen Technique, Equine Touch, Healing Touch, Reiki and Aromatherapy. Typically aromatherapy is included in most sessions as a relaxant and compliment to the techniques used. Due to their highly sensitive nature, holistic methods are received and processed very rapidly and effectively by animals eliminating the need for long and intensive sessions. Sessions typically are 45 minutes in length. The benefits are tremendous for our four-legged friends that are nearing or ready to move on from their earthly lives. Using relaxing techniques help to alleviate pain and bring a sense of peace and calmness.